Ok guys, I’m sorry to say this, but we will have to postpone the Disc Golf Tournament scheduled for tomorrow at 10am. Since the forecast is rainy and windy, we feel like Sunday will be muddy and slick. So, we are rescheduled for Saturday the 14th, 10am for singles, lunch, then teams. The EIPHC will hold our monthly Phlocking at the Emerald Club on Friday, April 7th from 7-9pm. The Phlocking will kick off a fun weekend that will include our First Annual Emerald Isle Parrot Head Club Disc Golf Tournament. The weather has gotten warmer and it’s time to get out and “Par-Tee” with a purpose. Come out on Friday to help kick off the weekend. Matt will be providing FREE food and the beverages will be cold and plentiful. The 50/50 drawing will benefit Emerald Isle Parks and Recreation to help replace the tee boxes on the town Disc Golf course at EI Woods. 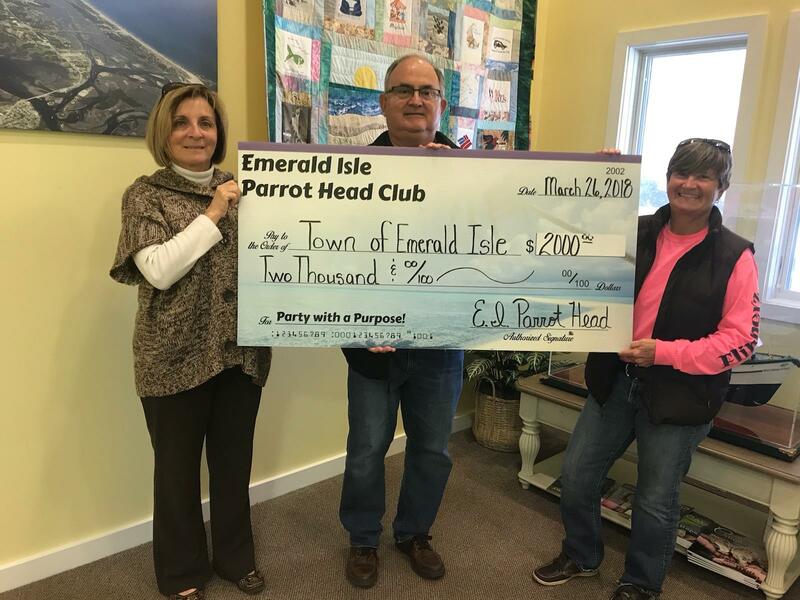 On Monday, March 26th the Emerald Isle Parrot Head Club presented the Town of Emerald Isle with a check for two thousand dollars ($2000). The money was raised at the EIPHC booth by raffling off items donated by club members and community businesses. The funds will be used by the town to purchase defibrillators for the town’s first responders. Mayor Barber accepted the check from event Big Birds – Jimi Crampton and Moh Traini. Thanks to all the volunteers working the booth and the individuals and businesses who donated prizes. The event was a great success and I’m pretty sure that a good time was had by all!! 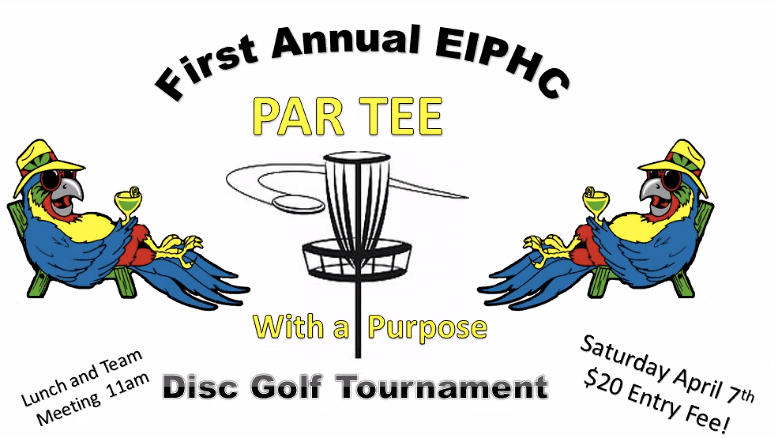 Just a reminder that we need volunteers to help with clean up of the disc golf course at EI Woods in advance of our Par-Tee with a Purpose Disc Golf Tournament in April. The clean up will be this Saturday, March 31st at 10am. Bring gloves and lots of muscle! Thanks and see you there. Wow, what an active month March has been! The accomplishments and acknowledgements of the EIPHC this month were profound! It started with our fabulous March Phlocking, followed by our Quarterly Board Meeting. 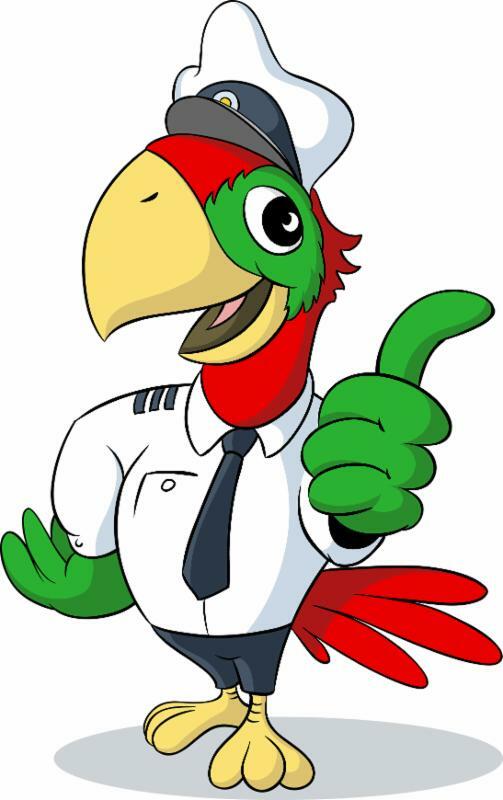 Next, I spoke at the Emerald Isle Business Association’s luncheon, on behalf of the Parrot Heads, who were eager to hear of the work and contributions made by us. 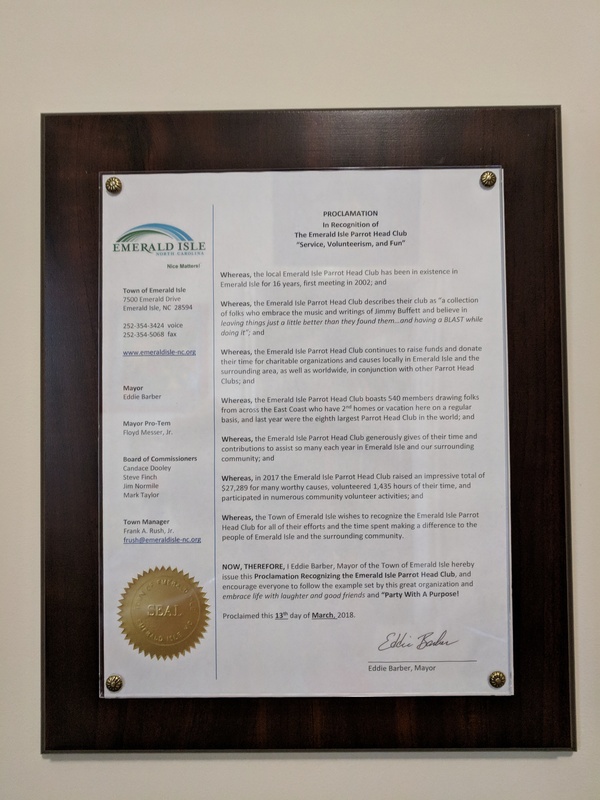 In the same week, Ken Stone, on behalf of the EIPHC, accepted a “Proclamation” from Mayor Eddie Barber, at the Emerald Isle Board of Commissioner’s Meeting, in recognition of our “Service, Volunteerism, and Fun.” Several Club Members attended to support Ken and show our gratitude to the Town. Later, it was time to head down to the Emerald Isle St. Patty’s Day Festival and join my Pheathered Phriends at the Parrot Head Booth. Wow, volunteers from our Club worked so hard all day and the raffle donations were awesome! Our efforts paid off! What a fun and beautiful day! Still not done…Carl and our Big Birds, Jimi and Moh, arranged to present a $2,000 check to the Town of Emerald Isle for the purchase of a much-needed defibrillator. Way to go Parrot Heads!! Great things are happening at EIPHC. Our volunteers and Big Birds are matchless. We are so fortunate to have you. In fact, the Board is currently designing a “Checklist” form to assist in the management of an event. We are continuing our efforts make it easier for any of you to be involved in our event leadership, no matter if it’s your first or thirty-first! The Emerald Isle Parrot Head Club will be sponsoring a new member social on April 25 th at the Island Time Tavern (across from Rucker Johns in Emerald Plantations.) It will be held from 6 to 9 PM. We are inviting all new members who have joined since October, 2017, but all members are invited. You will be responsible for your drinks, but the club will provide pizza. In order to make sure, we order adequate pizza, you will need to sign up at the April Meeting or contact Sue (stonesend@gmail.com) or Maggie (maggie.rauschenberg@gmail). Email invitations will be sent out to all new members who have joined in the past 6 months. REMINDER: Club member dues are due in January of each year, We have sent out reminders in the January and February newsletters. If your dues have not been paid by March 31st, your membership information will be removed from our data base. That means you will no longer receive emails, newsletters etc., from the Emerald Isle Parrothead club. If you decide to re-join later you will have to fill out a new application. If you are in town, you can pay your dues at our St Patrick’s Day Booth. If not, dues can be paid in the following ways. We are planning the biannual sound sweep by boat, on Saturday April 21st. We will try to match crew with boat captains, but are at this time looking for more boats! So please contact Val Johnson at gocoastalgirl@gmail.com if you have a boat, and/or can accommodate an eager crew! Ask your friends and neighbors too! Our tentative schedule is for Saturday April 21st from 11-1:00, starting in the ICW off the EI boat ramp, heading west, with a gathering on Pelican Island afterwards! If that Sat. doesn’t work for you, Bogue Banks Surf Rider Organization is planning a similar cleanup on Sunday April 22nd., cleaning the sound islands heading east. Let Val know if you need contact info for them. We had several new members join the phlock last night, and we welcome you and hope to see you at our New Member social in April. Also, El Presidente, Jan Hicks was slinging club t-shirts all night. Hope to see these being flaunted around the area! Thank you all for making our club fun, friendly, and giving! See you at the St. Patrick’s Day Festival!